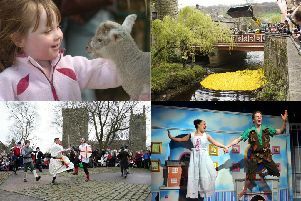 With thousands of photos covering more than 100 Yorkshire towns, villages and cities, the Hebden Bridge based After Alice Project is now online. The online version of the fully searchable archive features 10,000 images and every one is carefully titled, captioned, key-worded and has it’s map location included. There is space on their site for over a quarter of a million images. In March 2015, the projectbegan when a small group of photographers based in Hebden Bridge met in a pub and decided to create a photo archive with a difference. They work only with new photos and only shoot on film and they plan to keep the archive going for at least 100 years. The project was inspired by the late Alice Longstaff of Hebden Bridge whose photo collection goes back to the 1870’s. The After Alice Project does not receive public funding and contributors buy their own film and donate the negatives and copyright on the images to the project. All costs are paid by members who are all volunteers. The project continues to go from strength to strength and last year it won the ‘Best New Community Archive’ from the CAHG (Community Archives division of the ARA). Anyone can get involved with the project in several ways: by contributing images, adding names and valuable local knowledge to photos already on the site and by helping to maintain the archive and website. It’s open to anyone of any age who lives in Yorkshire and anyone who is interested in joining can visit the After Alice Project website at www.theafteraliceproject.org.